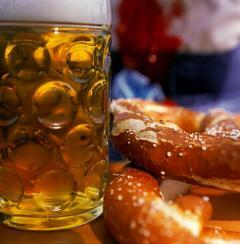 Beer Fellows: Beer Links for Oktoberfest! Oktoberfest is in full swing and Autumn is here. The next two months are my favorites in the year. Let’s take a look at a few headlines. Over 6 million people on 64 acres at tourist prices? I think the safe answer is yes, it's a tourist trap. I still want to go. Can’t make it to the big one? Here are some American alternatives. Want to get away from the big one? Here are some other Deutsch alternatives! Oh stupid beer crime, I do miss you. Drink before you go in the stadium...it will save you money. Not much in the way of beer, but it could make for an entertaining evening. This right here is why America is currently the best beer country in the world. Not only are we brewing more styles, we are even bringing them back from the dead. I'll be a bit put out if I can't get a few bottles for some reason when I go to Denver in a few weeks. I just want to know what beer they have! I don't need an excuse to drink beer but if one is available then why not use it! I think this will be the perfect opportunity for a big ol' beer roundtable with the JGF crew. Oktoberfest month drives on so we will have some more Oktoberfest reviews and commentary coming your way so stay tuned.